The music of Ferde Grofé is alive with vivid impressions of the American scene as he saw it - from the sidewalks of his native New York to the wide open spaces of the Far West. Always alert to the rhythms, melodies and harmonies of his country's life, Grofé turned to subjcets like Metropolis, Mississippi Suite, Three Shades Of Blue, Tabloid Suite. Most of all, and most memorably, he turned to a natural phenomenon called the Grand Canyon. Here is Grofé's musical evocation of the Canyon - the elements, the sights and sounds, the wild life, the panoramic splendor. The first of the five movements is SUNRISE. Dawn appears over the desert, heralded by a soft roll on the kettledrums, followed by a series of chords played by the woodwinds. The main theme - initiated by the English horn and taken up by the other instruments - depicts the full brilliance of the breaking day. Next, vast and mysterious: PAINTED DESERT. The movement opens with a strange, evocative theme played by bass clarinet and viola. Woodwinds and piano emerge in weird harmony, then - as the bright rays of the sun flood across the sands - we hear a contrasting melody of lyric quality. ON THE TRAIL - the most popular movement of the Suite - introduces a traveler and his burro. The bray of the burro is heard, then the graceful rhythmic melody of his hoofbeats. Against this background emerges the contrapuntal melody of the cowboy's song. The traveler sights a lone cabin (the celeste plays a suggestion of an old music box), stops there briefly, then travels on. As evening overtakes the day, there is SUNSET. Now animal calls are heard from the distant rim of the canyon. The horns open the movement, introducing the main theme played on bells and violins. The theme is developed in turn by oboes and violins, by woodwinds and violins, by cellos and horns, by horns and flutes. Finally a fading repetition of the opening calls of the horns echoes into the now-fallen night. CLOUDBURST is the final and most pictorial movement of the Suite, encompassing the whole range of a violent storm: the ominous approach, lightning, thunder, torrential rain - then a sudden calm and the emergence of the moon from behind the clouds. Grofé uses all the resources of the orchestra to portray the battle of the elements - then after the storm is over, builds a final, gradual crescendo that forms the climax of the entire suite. 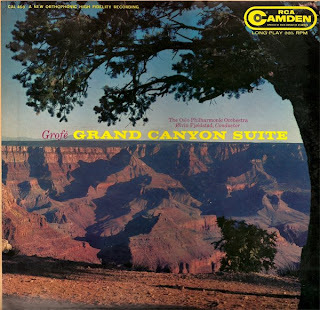 The Grand Canyon Suite was first performed in 1931 by Paul Whiteman's orchestra. It received wide critical recognition as an outstanding achievement in American music, and it was enthusiastically greeted in Europe. Today it is an established favorite, performed by distinguished orchestras here and abroad. In this recording one of the most distinguished - The Oslo Philharmonic - gives a particularly rich and rewarding interpretation. Frede Grofé was born in New York in 1892. As a child he studied piano, violin, viola and harmony. At 17 he joined the Los Angeles Symphony Orchestra, and in 1920 he became pianist and arranger for Paul Whiteman's Orchestra. Grofé first attracted attention with his orchestration of Gershwin's Rhapsody In Blue, and he subsequently began to compose on his own. In the Grand Canyon Suite he produced one of the most popular and wide-recognized pieces of orchestral music ever written by an American composer. The Oslo Philharmonic, which made this recording stereophonically in June 1958, stands as one of Europe's important symphony orchestras. It was permanently established in 1919 after some fifty years of effort by Norwegian music lovers and musicians to found an independent orchestra. The original backer was none other than Edvard Grieg. Today an annual season includes about 120 concerts, many with the world's most prominent guest artists, and extensive tours. Øivin Fjeldstad, who conducts this performance of the Grand Canyon Suite, is chief conductor of the Norwegian State Broadcasting Service, and of the newly-established Norwegian State Opera.